Welcome to www.HuntLLC.com. We are independent contractors for a Columbia SC real estate agency and offer full service in all aspects of real estate in the state of South Carolina. We primarily focus on brokerage in the Midlands of South Carolina including Richland, Fairfield, Kershaw, Lexington, Lee and Sumter Counties. As a member of the Consolidated Multiple Listing Service, commonly called Columbia SC MLS, we can help you with buying, selling, and investing in land, homes and commercial property. We represent both buyers and sellers and can offer you a variety of services and professional consultations to investigate and protect your investments. We have also had years of experience in every aspect of real estate and can help you find the right contractor, painter, banker, appraiser, developer or whatever you seek. We provide this service to all of our clients continue to maintain our ethical standards by providing everyone with honesty and diligence. We are experienced Columbia SC real estate agents that depend on real estate brokerage and investment as our full time job and primary focus. Foreclosed homes and short sale listings are populating the MLS and real estate agencies are constantly changing their business model to accommodate clients that are looking for foreclosed homes for sale in Columbia SC. Real Estate Owned Properties, commonly abbreviated as "REO Property", is an entirely different process than a traditional owner occupant transaction. It usually takes several days longer to get a response of whether or not your offer has been accepted, or declined. More often than not, your real estate agent will be dealing with an online system and not have a direct line of communication with the person in charge of the particular asset that you are offering to purchase. There is a system in place to streamline the process for the asset company and they insist that you abide by their procedure. Buying foreclosed properties demand time, patience, and compliance. Our agency is involved in these types of transactions on a regular basis and we understand the basic techniques that asset companies are accustomed to. If you decide to buy a foreclosed home in Columbia, please remember that real estate agents are constantly pushing to get an offer ratified and a settlement time scheduled. Asset management companies also have their own procedures they must abide by, so please be patient and understanding of our position in these purchases. We have vast experience in land sales and we have been in business focusing on this niche market for decades. Just recently, we have tapped into the excellent online marketing and research that has been continually growing since the beginning of the millennium. Our traditional face-to-face style that we have been accustomed to has made a transition by involving the newest technology to better suit land and home buyers that prefer to begin their real estate search in the convenience of their own home or office. Buying land can be challenging and overwhelming for investors that have no experience with this aspect of real estate. Waterfront Property, Investment property, building lots, recreational hunting acreage, equestrian property, mini farms and timber tracts are very popular in rural areas around the midlands of Columbia SC. We have years of experience and a few strategies that will help you have a smooth experience when purchasing your land. An inexperienced agent may cause more harm than good if they are not familiar with the proper procedures of purchasing land. It is a completely different process than home buying and our experienced agents know how to protect our clients with strategies that may save you thousands of dollars. Residential home sales in Columbia, SC are constantly evolving and changing. In today's market, home prices are becoming more competitive and can be more or less valuable than they were years or even months ago. To help with these constant changes, we have the staff to help you in your sale and purchase of residential property. Our home specialists study market trends and comparative market analysis every day. All of our agents are full time Brokers and Real Estate Licensees and depend on real estate as a primary source of income. We also depend on our up-to-date knowledge and referrals that have been given to us from past clients to maintain our strong reputation. We have been involved in new construction and renovation for years, so we know what questions to ask home inspectors when evaluating a home. We are not home inspectors or licensed contractors... but have relationships with professionals in this industry. We can recommend reputable and qualified contractors and inspectors. We can provide you with literature such as the "International Residential Code" book that you can review to find specific building code standards. We are confident, as lifetime residents of Columbia, we have the knowledge and expertise you can depend on to ensure your real estate transaction fits your needs. Columbia is filled with subdivisions and neighborhoods to fit just about anyone's needs. Many home seekers are looking for new construction communities and neighborhoods with quality built homes. But Columbia is divided into several sectors and sometimes its difficult to find the right area if you are new to the city. This is why we are building a Columbia SC Neighborhoods database with a map of each subdivision, pictures, a brief description and active MLS listings for each Columbia subdivision. If you are unable to find the neighborhood on our "Subdivisions" page and would like to research a specific neighborhood for listings, you can always revert to our Search By Subdivision(Neighborhood) section which covers all of Columbia, Blythewood, Irmo, Lexington, Camden, Elgin and the entire Columbia Midlands area. There are also listings in other counties that may not necessarily be within our Columbia's primary area. If at any time you need help and/or direction on where to find a home in Columbia, you are free to contact us for help. For your convenience, we are almost always available (7 days a week) for showing land, lots, acreage and homes in Columbia. 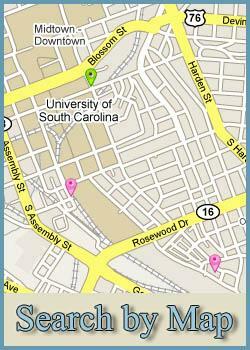 South Carolina has some of the finest colleges and universities in the nation. These include The Citadel, Clemson, Wofford, The College of Charleston and The University of South Carolina(or USC). USC plays a significant factor in Columbia SC economics and generous Gamecock die-hards support the university with donations to scholarship funds through Gamecock athletic programs. If you have recently relocated to South Carolina you will quickly begin to understand the love for college football in the south. In 2010 the USC gamecock football program won their first SEC East title and recruited the number one high school prospect in the country. And winning the College Baseball World Series back-to-back years reinforced the confidence of how athletic programs can achieve goals with determination, ethical values and most importantly high educational standards. With all of these recent achievements there has been a growing number of gamecock tailgating facilities available that combine social and educational values. In addition to the “Columbia SC Neighborhoods” page as mentioned in the paragraph above, we are incorporating a Gamecock Tailgating section into our MLS search pages. You may visit our comprehensive search for real estate listings near Williams Brice football stadium for parking and condominiums close to the University of South Carolina. If we’ve missed a neighborhood or condominium building that you would like more information for, please let us know and we will research additional areas for you. Our purpose is to provide customers and clients with friendly, honest and personal service. We encourage sellers to competitively price inventory so that monetary negotiations will be minimal. Our specialists have had hours of licensing and training to ensure that our customers, our clients and the general public will be protected. We have all been approved by the South Carolina's Licensing, Law and Regulation standards. Our goal is for you to know that you are getting top quality and honest service. As well as provide you with: obedience, loyalty, disclosure, confidentially, accounting and reasonable care and skill. We have represented sellers for all types of property transactions including land, acreage, homes, lots, new construction, foreclosure, HUD housing, subdivision marketing, bulk rental and commercial property. Our objective is to offer you the full service that you desire and will assist you every step of the way until you are completely satisfied. We will also post tips on our real estate blog for our visitors to research. In-depth view of Your Area's neighborhoods and communities.